This truck also has a extra 2 1/2 inches cab length and allows for a larger driver not to have to remove the steering wheel to fit in. Closed Extra Length Cab Pickup. Finished as close as possible to original production line standards. Original 1930 CA license plate. Legal license plate drops down when you start it. This is a great running truck up grades include a 12 volt system up grade, also a high low over drive transmission has also been installed to achieve top speeds. We also installed a electric flip down legal license plate for those times you want to show off this beauty wherever you want! February 4, 1929, one million Model As had been sold, and by July 24, two million. The range of body styles ran from the Tudor at US$500 (in grey, green, or black) to the Town Car with a dual cowl at US$1200. In March 1930, Model A sales hit three million, and there were nine body styles available. Prices for the Model A ranged from US$385 for a roadster to US$1400 for the top-of-the-line Town Car. The engine was a water-cooled L-head inline four with a displacement of 201 cu in (3.3 l). 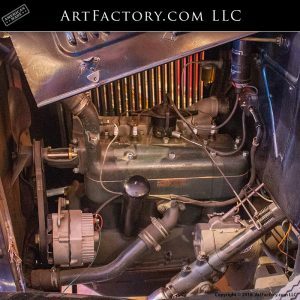 This engine provided 40 hp (30 kW; 41 PS). Top speed was around 65 mph (105 km/h). The Model A had a 103.5 in (2,630 mm) wheelbase with a final drive ratio of 3.77:1. The transmission was a conventional unsynchronized three-speed sliding gear manual with a single speed reverse. The Model A had four-wheel mechanical drum brakes. The 1930 and 1931 models were available with stainless steel radiator cowling and headlamp housings..
Henry Ford's first attempt at a car company under his own name was the Henry Ford Company on November 3, 1901. They became the Cadillac Motor Company on August 22, 1902, after Ford left with the rights to his name. The Ford Motor Company was launched in a converted factory in 1903 with $28,000 in cash from twelve investors. Most notably John and Horace Dodge(who would later found their own car company). During its early years, the company produced just a few cars a day at its factory on Mack Avenue. Groups of two or three men worked on each car, assembling it from parts made mostly by supplier companies contracting for Ford. Within a decade, the company would lead the world in the expansion and refinement of the assembly line concept, and Ford soon brought much of the part production in-house in a vertical integration that seemed a better path for the era. From the mid 1910s through the early 1920s, Ford dominated the automotive market with its Model T. However, during the mid-1920s, this dominance eroded as competitors. Especially the various General Motors divisions, caught up with Ford's mass production system and began to better Ford in some areas. By offering more powerful engines, new convenience features, or cosmetic customization. Also, features Henry Ford considered to be unnecessary, such as electric starters, were gradually shifting in the public's perception from luxuries to essentials. Also Ford's sales force recognized the threat and advised Henry to respond to it. His ideas to improve the DFM of forging did not prove practical. Eventually, Ford's engineers persuaded him to relent, lest the Model A's production cost force up its retail price too much. Henry's disdain for cosmetic vanity led him to leave the styling to a team led by his son Edsel. He would take credit for it despite his son doing more of the work. 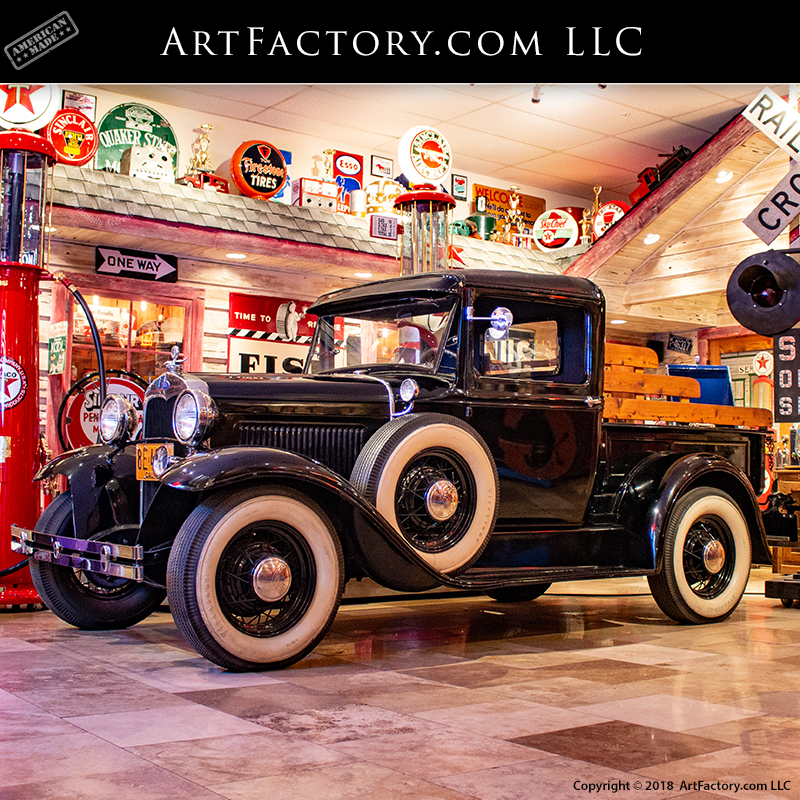 Since 1913, ArtFactory.com has been in the business of making old look new again. In addition to crafting high quality, handmade, fine art furnishings, we do museum quality antique restorations as well. We can restore your antique furnishings, and man cave collectibles to world class, museum quality standards. All of our restorations are done to historically correct, original specifications.